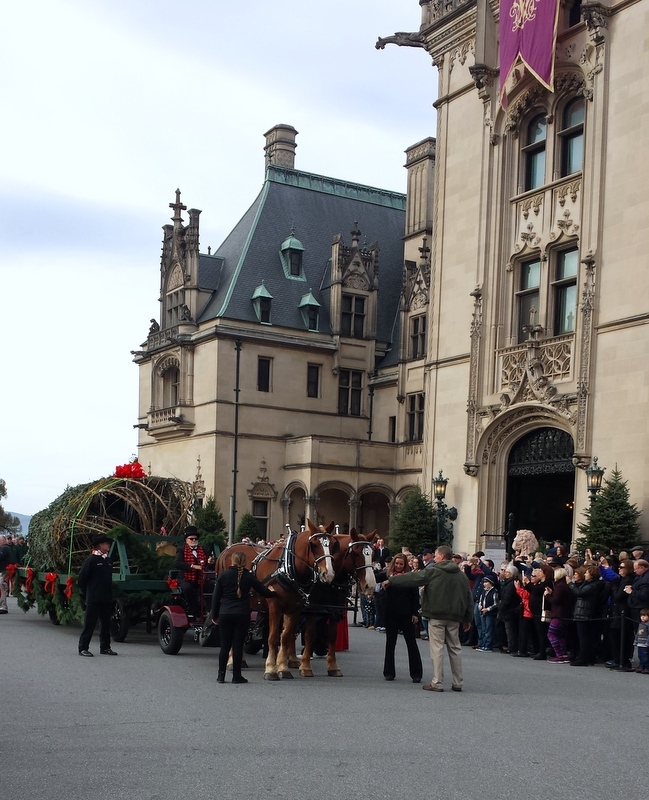 The Biltmore Christmas Tree Arrival! On November 1st, we went to the estate to watch the arrival, by horse drawn wagon, of the 35 foot tall banquet hall Christmas tree. It was an appropriately chilly morning while we waited for the tree and Santa himself. The wagon’s entrance into the gate was heralded by a trumpeter who was stationed in a turret window in the house. Getting the tree through the doorway takes a lot of muscle! While many people went into the house to see the actual raising of the tree, we strolled the grounds drinking hot chocolate. Santa and Mrs. Claus awaited the children that came to visit. Once the crowd lessened somewhat, we entered the house. We loved watching the crew get the tree prepared for decorating. We're going to wait until Thanksgiving to see it and the entire house in full splendor!